My grandmother was a natural and spontaneous cook, she could whip up recipes in no time, and would just add ingredients without ever measuring them in teaspoons or tablespoons. 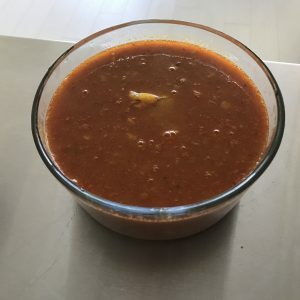 One such quick recipe was her Aloo Tari that I’ve adapted into an Instant Pot Aloo Tari recipe. She preferred cooking on an earthen stove, called a Chulha in Hindi. Grandma believed that it made the food taste better and made it a bit more aromatic. Whenever I would visit home for the summer and winter vacations, she would spoil me rotten with delicious food. I think it is due to her constant care, attention and affection towards me in my formative years that made me a picky eater who now prefers indulging in good food any day over eating healthy food! Grandma would gratify me by cooking things that I loved; dishes like Aloo Puri, Plain Parantha with an Aloo Sabzi, Aloo Parantha and more Aloo. In case your didn’t notice – all of the above are made with Potatoes. Not that I did not eat other things, I did, but for those precious few months, Aloo was always on the table, sometimes even thrice a day! She would make different varieties of Aloo everyday till my vacations were over. I remember as an eight year old sitting by the kitchen, called Chauka in our part of Madhya Pradesh, and waiting for her to finish her cooking. Once she was free, we would eat together, from the same plate with her feeding me with her hands. Sadly, I lost her quite early on, too young to remember any of her recipes. 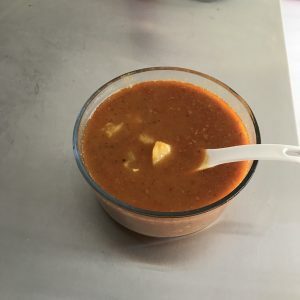 Over time, I gathered some of those recipes from my mother and aunt, but I could not quite get the Aloo Tari recipe because very rarely did one write down the very simple yet the most relishing recipes those days. Although I have experimented multiple times with various recipes, I could never get the flavour and the tanginess of the tomatoes quite right like she used to make. 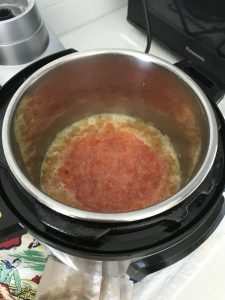 But recently, I chanced upon a recipe on Facebook by Your Food Lab, and adapted it to my liking on the Instant Pot. And I’m quite pleased with its ambrosial similarity to that of my grandmother’s Aloo Tari. Aloo Tari in an Instant Pot is an instant favourite of many, can be cooked in no time and goes well with both rice and roti. Firstly, switch on the Instant Pot on Sauté Mode. Next pour some oil and let it heat for a while. Add the Rai (mustard seeds) and wait till the seeds splutter. Then add the Besan (Gram flour) and stir continuously, to avoid any lumps. Crush the ginger garlic together to make a paste. Follow by adding the ginger garlic paste and stir for 45 seconds. Throw in the heeng (asafoetida) and stir. Now add the tomato puree and stir and incorporate. Cook the tomato puree in the Besan masala for a while and then add all the spices. Continue to stir for about a minute. Throw in the diced aloo (potatoes) and salt and mix well. Pour water to adjust the consistency of your tari (gravy) and stir. Now cancel the Saute mode and close the lid in the Sealing position. Pressure Cook this Aloo Tari Sabzi for 5 mins and let the pressure release naturally. Done– Instant Pot Aloo Tari! The Aloo Tari is now ready! Garnish it with some chopped coriander and serve. Now that I have been able to recreate a childhood favourite with with the Instant Pot, I am sure there will be many meals reminiscing about holidays spent with grandma and her food. 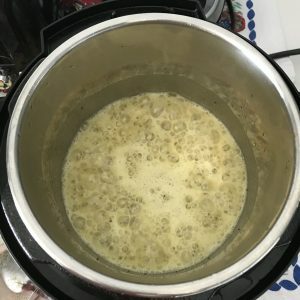 Hope you enjoy it just as much as I did and continue to do with my Instant Pot adaptation. The Instant Pot Aloo Tari is an instant favourite of many, can be cooked in no time and goes well with both rice and roti. Next pour water to adjust the consistency of your tari (gravy) and stir. You can adjust the thickness of the gravy (literally Tari) by adjusting the amount of water. The amount of red chilli powder in this recipe is one and a half teaspoons. If you are using Kashmiri red chilli powder you may use more as it packs less heat. If you don't want the gravy to be hot then you can do with just a pinch of red chilli powder. If you prefer your food to be not too tart then you can skip adding the Amchur Raw mango powder. Raw Mango powder or Amchur is available at most Indian groceries.